Free Printable 2014 Brazil World Cup Maze. 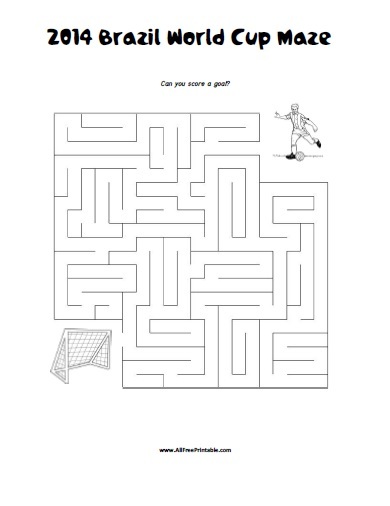 Free Printable 2014 Brazil World Cup Maze activity to have for your kids and celebrate every goal of the 2014 World Cup. Print free 2014 Brazil World Cup activities here. Print the maze free using your inkjet or laser printer. Great printable that you can share with your family at home, with students at summer school or summer camp, homeschooling. Just help this player score a goal to solve the maze. Is a great idea to have extra printable games and activities for the summer vacations. The 2014 Brazil World Cup Maze is very easy to solve. Click the link below to download or print the free 2014 Brazil World Cup Maze Game now in PDF format. Mary, your site has blessed me in many ways. I live in Brazil, and atentd a small Baptist church at Ananindeua city. Here we struggle with every kind of difficulties regarding study material. Your site as a whole, and the links section, particularly, provided me access to life changing content. May God continue to bless you and your family, and keep encouraged to maintain and expand this site, to His honor. Thank you.